MSF enthusiastically welcomes the report from the UN Secretary-General’s High-Level Panel on Access to Medicines, which puts forth actionable recommendations to help overcome the challenges that our medical teams have faced for decades – being left essentially empty-handed when the medicines, vaccines and diagnostics we need for patients don’t exist, or are too expensive. We especially welcome the report’s focused mandate and its global scope that recognises that today all countries and people, no matter where they live, face challenges in affordably accessing the medical tools they need to live healthy lives. High drug and vaccines prices are now a global crisis, for a broad variety of diseases and medical technologies, including in developed countries where medical care is being rationed and health budgets are under threat. The UN Secretary General’s High Level Panel’s report also recognises a global innovation crisis. During the Ebola outbreak there was no effective, ready to use vaccines, treatments or diagnostics, and today there are still no effective and ready to use treatments. Standard drug-resistant tuberculosis treatment remains painful, toxic, unaffordable and mostly ineffective to save lives, and antimicrobial resistance is growing with very few new antibiotics in the development pipeline. Yet governments are making change difficult for us and for themselves. 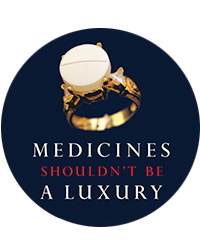 Some governments are negotiating expanded intellectual property protections on behalf of pharmaceutical corporations through trade agreements that will keep affordable medicines out of the hands of people and medical treatment providers like MSF for ever-longer periods of time. For years, MSF has campaigned against the US-led Trans-Pacific Partnership Agreement (TPP). Two weeks ago, MSF raised the alarm about proposals included in the ongoing negotiations of the Regional Comprehensive Economic Partnership (RCEP) agreement, including Investor-state dispute settlement provisions that will allow pharmaceutical corporations to sue governments that try to promote public health and access to medicines, like Canada, Colombia and recently Ukraine. The UN Secretary General’s High Level Panel’s report correctly recognised that countries have options to demonstrate a better path forward. The report recommendations urge Governments to reform the way R&D is performed so that rather than being guided by what earns the highest returns, companies and innovators are guided by incentives that encourage them to focus on developing drugs that address unmet and essential health needs, that do not trade off innovation and access, and in particular that de-link the cost of R&D from the expectation of high prices of the end product. MSF would like to recognise the leadership of the countries that have requested that the recommendations of the Report be discussed in the 34th session of the Human Rights Council. Create a process for OHCHR to perform human right public health assessments of trade agreements, so that bilateral and regional trade and investment treaties do not include provisions that interfere with government obligations to fulfil the right to health as recommended in the UN HLP Report (2.6.1.e). These impact assessments should verify that increased trade and economic benefits are not endangering or impeding human rights and public health obligations of governments and its people before entering into such commitments. Assessments should inform negotiations, be conducted transparently, and be made publicly available. Create a process for OHCHR to assist in the periodic review of the access to medicines challenges in countries, in light of human rights principles and States’ obligations to fulfil them as recommended in the UN HLP Report (4.3.1.a). The results of these assessments should be made publicly available. Civil society should be financially supported to submit their own shadow reports on innovation and access to health technologies. Create a process for OHCHR to help increase national policy coherence and facilitate the participation of Human Rights entities and civil society in relevant national processes and negotiations. The UN HLP report (4.3.1 b) recommends that Governments should strengthen national level policy and institutional coherence between trade and intellectual property, the right to health, and public health objectives by establishing national inter-ministerial bodies to coordinate laws, policies and practices that may impact on health technology innovation and access. Appropriate member/s of the national executive who can manage competing priorities, mandates and interests should convene such bodies. The deliberations and decisions of such groups should operate with maximum transparency. Civil society should be financially supported to participate and submit their shadow reports on innovation and access to health technologies. Create a mandate for the UN Special Rapporteur on the Right to Health to develop guidelines and best practices on how to increase transparency on R&D, production, pricing and distribution of health technologies as recommended in the UN SG HLP (recommendation 4.3.4).